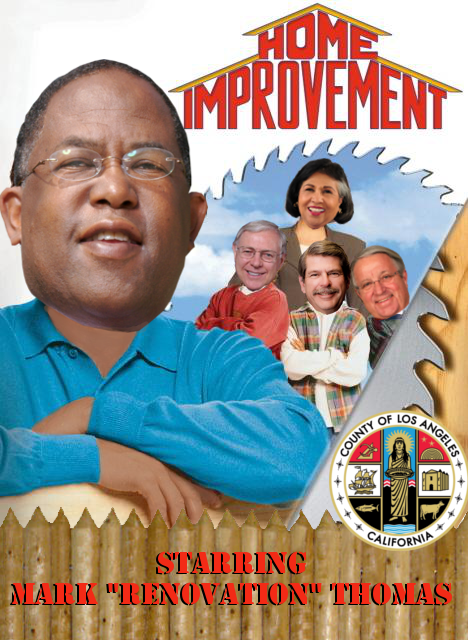 Mayor Sam proudly presents its latest parody featuring LA County Board of Supervisor Mark "Renovation-Thomas" ( with City of LA Building and Safety Permits outstanding). Great bloggin morning to everyone as we proudly present our latest LA Political Machine Parody featuring the taxpayer's financed garage conversion exploits of LA County Board of Supervisor Mark "Renovation-Thomas" (wondering if he will invite Betty Pleasant over to his new "Man-cave" to watch the Super Bowl on his county-installed Flat-screen TV this Sunday?). While you chuckle at our "Renovation-Thomas Parody", he and his four other LA County Supervisors Colleagues are meeting behind close doors in discussing how to choreograph the appointment of California Governor Jerry Brown's favorite AB-109 shill, former Department of Corrections Official, now LA County Sheriff Jails Overseer Terri McDonald, as the Interim Sheriff, replacing Lee Baca. The response to our Monday piece regarding McDonald's dubious past at the Department of Corrections is making the rounds in both the LA County Probation Department and the State of California Corrections Social Media and Blogs. Look for many concern with reforming the State Department of Corrections and exposing the debacle that is AB-109 Prison Realignment, to show up and speak out against the likes scandal-connected Margarita Perez and Terri McDonald. ** Noted AB-109 Dumping Expert City Attorney Mike Feuer is getting some editorial love from the "Old Gray Collectivist Hag on Spring Street" (aka LA Times) for standing by his campaign promise of reinstating Neighborhood Prosecutors. Of course the Fellow Travelers that make up the "West LA Collectivist Propaganda Organ of Record", fail to note that the Bet Tzedek Campaign Contribution Dumping Repository Expert, was no where to be found when former Failure Mayor Antonio Villar and the City Clowncil Central Committee were playing political payback with the Office of City Attorney Budget, during the reign of former City Attorney Carmen Trutanich. ** In case you have not kept up with the Thursday's Soulvine Columns of longtime LA Wave Newspaper Yellow Journalist Betty Pleasant, her current commentary Jihad against Mayor Eric Garcetti over South LA's shafting in regards to President Barack "H" Obama's Promise Zone Redistribution Funding for Mid-city LA, may have prompted a counter Op-ed in the "Old Gray Collectivist Hag on Spring Street" by the Executive Director of the Mayor Garcetti-conected Non-Profit Youth Policy Institute.